2Set a large skillet over medium-high heat. Add the butter and when the foam subsides, sauté the apples for 3-4 minutes, until they're soft and starting to turn golden. Add the brown sugar and cinnamon and cook for a few more minutes, until any excess moisture cooks off and they're softened and syrupy. 3On a lightly floured surface, roll the pastry out into a 11-12 inch square (or just unroll it, if it's pre-rolled). Transfer to a parchment-lined sheet and spread the apples down one half, leaving half an inch or so around the three sides. 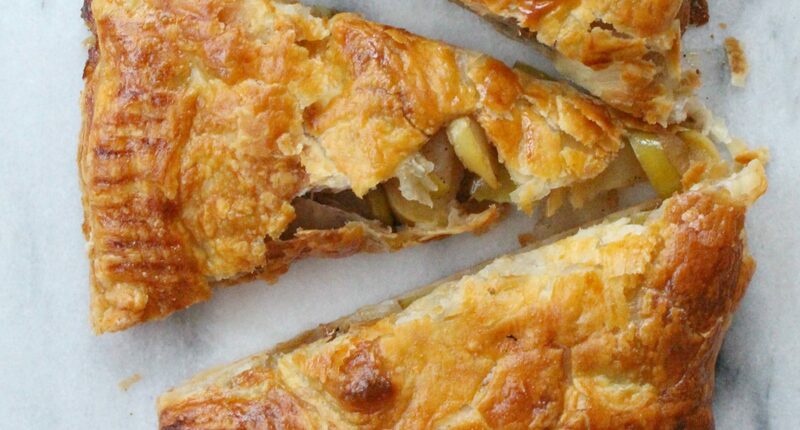 Fold over the pastry to cover the apples - it doesn't have to look perfect - and press down around the edges with the tines of a fork. 4Brush with beaten egg and cut a few slashes in the top with a sharp knife to help steam escape. Bake for 15-20 minutes, until deep golden. Let cool for a few minutes before cutting into slices or wedges. Serves 4-6.